Kent’s novel has immediate appeal. Beyond the ghoulish fascination of beheadings, it taps into the prevailing hunger for historical fiction. Based on a true story, its cast of characters would seem implausible, were they not based on real people: Agnes Magnúsdóttir (1795–1830), a housekeeper who struggles, like Thomas Hardy’s Tess, against harsh and indifferent fates; Natan Ketilsson (1792–1828), a Rasputin-like herbalist and farmer who is Agnes’s employer and sometime lover; and Rósa Gudmundsdóttir (1795–1855), another of Natan’s lovers, who also happens to be one of Iceland’s most famous poets of the early nineteenth century. Behind Agnes’s execution lies a double murder and a complex love triangle. This much is known: on a spring night in 1828, Agnes woke a neighbouring household to tell them that the Illugastaðir farmhouse was on fire. Natan and his friend Pétur Jónsson, she said, were trapped inside. Unfortunately for Agnes, the fire was quickly doused and it became clear that the two men had been stabbed before the blaze. Agnes was arrested, along with an avaricious farmhand named Fridrik and his sixteen-year-old girlfriend, Siggi, who was later sent to a Copenhagen textile prison. Agnes and Fridrik were beheaded by Natan’s brother on a small hillock in Húnavatnssýsla on 12 January 1830. Kent has built her narrative around a small trove of historical documents associated with the murders: a public notice announcing an auction of Natan’s valuables (variously a cow, a few horses, sheep, a saddle, a bridle, some plates), a list of Agnes’s assets (among odds and ends, ‘an old blue skirt with a blue bodice of plain-woven wool, with a red collar and eight silver buttons’), extracts from the Supreme Court trials of 1829, and various contemporaneous eyewitness and character testimonies. Agnes’s shock is palpable, yet the precise source of her disbelief is unclear: is it triggered by her grief at the death of the man she too loved, by an accusation of a crime she didn’t commit, or by fear at her impending death? It is the task of the novelist to decide. Agnes and Fridrik were not permitted Christian burial rites: their heads were exhibited on sticks as warnings, and their bodies buried on site without markers. Nearly two hundred years later, Agnes now shares a modest grave with Fridrik in the churchyard at Tjörn. During the relocation of their remains, fragments from Agnes’s dress – she had dressed in her finest for her final moments – were found among her bones. They are exhibited in Iceland’s national museum, along with the axe that was sent to Iceland especially for the executions. It was used only twice. Kent’s instinct for story is on bright display in Burial Rites. Over the years the murder case has been the source of much discussion in Iceland. Several books have appeared on the subject, and in 1995 a film entitled Agnes appeared by director Egill Eðvarðsson. Not that this would preclude yet another Holly-wood remake of a Scandinavian film. Kent’s skill in driving the twin narratives of the murders and the executions to their ghastly inevitabilities demonstrates that she is a writer of great promise. Burial Rites is not a particularly challenging read, and it leans heavily on devices associated with genre fiction. But it does challenge the idea that Agnes is, as one source described her, ‘an inhuman witch, stirring up murder’. In the author’s note, Kent states that she wrote her novel ‘to supply a more ambiguous portrayal of this woman’. But Burial Rites is more than this: it is a love song to a woman who lived and loved with the odds stacked against her. 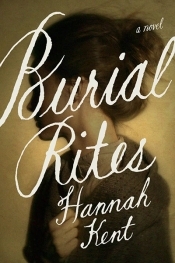 Review of Burial Rites by Hannah Kent. Originally published in Australian Book Review (May 2013). I could not stop, so I read it in one day!